On Monday Feb. 6, Commissioner Pat Kemp hosted a Community Conversation to discuss options for improving mobility and safety in Brandon. About 50 people filled a room at the event held at the Bloomingdale Library in Valrico from 6-8pm. A copy of the agenda listing the speakers was the only hand-out for the audience. Maps showing the proposed plans were on an overhead and very difficult to read from the audience. The meeting started out with each panel member giving a spiel of their area of expertise. There was no opportunity for the public to raise their hands to comment on or ask any questions as each panelist spoke. There was some question and answer time at the end, but we had to first sit through an hour and a half of old talking points. A lot of transportation jargon was used and many in the audience seemed confused by some of the terms and were seen searching on their phones for the definitions. 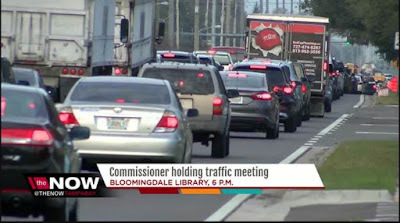 Sarah McKinley discussed reverse lanes on Bloomingdale but ended by saying there are too many issues for this to work. Another option discussed was widening Lumsden from 4 lanes to 6 lanes. This would also require widening Lithia Pinecrest and has not been funded yet. She moved on to BRT (Bus Rapid Transit) along Hwy 60, and Oakfield (maybe), and transit circulators (hubs). She said the Planning Commission has recommended acceptance of the last two, BRT and circulators. Next to speak was Steve Feigenbaum. He started by asking if transit is the solution to the transportation problem (transit was the term used when they were referring to rail). His answer was Yes and No, and said we need to go with TOD (Transit Oriented Development). He then asked the audience how many now use HART buses. NOT ONE PERSON RAISED THEIR HAND. He commented that in a group the size of the audience there should be at least 4 or 5 hands raised. He then mentioned “Mission Max”* was just completed, but this was one of the terms not defined leaving a lot of puzzled faces in the audience. His next topic was the budget shortfall this past year. Ridership is down. He said it is a challenge for “us” to remain relevant, and they hope to do this by adding more routes such as the line planned from FishHawk to MacDill and from Hwy. 60 in Dover to the mall to run every 30 minutes, and a Hyperlink to Riverview. John Lyons informed the audience that the county has $26 million for resurfacing now. Valrico Rd. will be resurfaced. Also, Bell Shoals resurfacing and widening will begin by this fall. It has cost $25 million for right of way along Bell Shoals. Ed McKinney started out by telling everyone he was battling the flu- GREAT! A couple joked it was now time to leave! His view of the problem is that we are a growth state, but a low tax state and he sees that as a problem. Of course, they think raising taxes is the answer. He explained that there are three types of roads- city, county and state, but said they don’t expect the general public to understand the difference in a city, county, or state road. Yea, thank goodness we had an “expert” to explain that to us! He said there is the possibility of widening Hwy. 60 from Brandon to Plant City from 4 to 6 lanes, but the biggest problem he sees is a lack of connectivity with Hwy. 60 which is now more of a local road than the highway it was first designed to be. 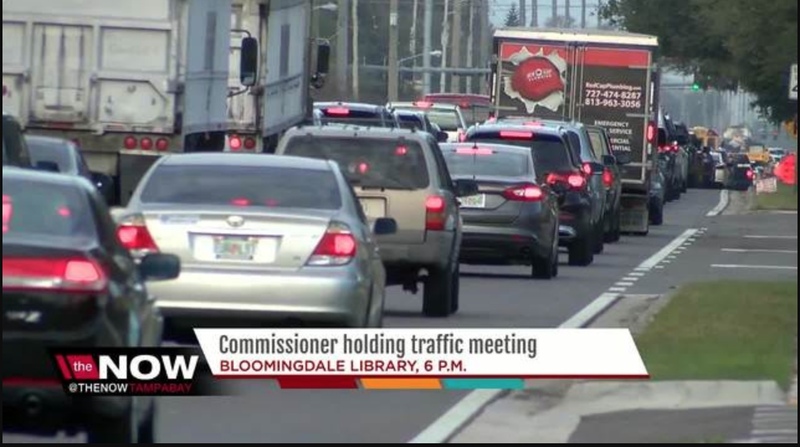 He mentioned a plan to widen Bloomingdale and move local traffic from Hwy 60 to Bloomingdale, making 60 more of a truck route from Brandon to Bartow. At this point Commissioner Kemp switched to the topic of ferries. She wants public private partnerships for these and then went off on a tangent about ferries in Staten Island and how we need ferries here too. Finally it was time for questions from the audience. One question was about protecting agricultural land from developers and Jay Collins answered saying we have to protect property rights of land owners and then said we need to look at encouraging more compact development in the service areas. Another gentleman said something as simple as extending the length of turn signals to allow more cars to turn and adding continuous turn lanes was the type of improvements he would like to see since these would have an immediate result. He was told they would look into that, but doubt he is holding his breath. Next, a question was asked about how they are including social justice in their plan to look at community and not individual needs. This excited the entire panel so each one had to comment on it. Sarah mentioned something called Healthy Cities Initiative** that she said addresses this, but again, did not explain what this is. The event was advertised as a "conversation" inviting Brandon and Valrico residents to discuss their concerns about traffic congestion. The first hour or more was mostly a monologue from the so-called experts and central planners. Some in the audience were obviously disappointed as they came expecting much more time for questions and two-way conversation. Over all it was a very weird meeting. Several left early. People want solutions now, not some plan for rail or transit that won't happen in many of our lifetimes, and won't help our area in east Hillsborough anytime soon. Next time let the public speak first to voice their concerns. The bureaucrats and electeds can provide hand-outs of their monologue spiel with their contact information and then they should spend most of the time listening to the public and responding. The public probably knows more about the transportation issues they face everyday than those sitting in the ivory towers. **Healthy Cities Initiative is an approach originally initiated by the World Health Organization (WHO).